Grilling fruit is a fun way to make a perfect summer dessert or use a grill pan if it is winter or Mother Nature is not working with you. Add ice cream and it is a summer time classic or to remind you of summer. The addition of the chili powder does not make it spicy, but enhances the combination of ingredients. One bite with the ice cream might remind you of a piña colada with a “little something else”. The chili power is the secret ingredient that will leave them chatting for hours! Ingredient amounts will make 2 large skewers or 4 small skewers. Ingredient amounts will serve 4. Adjust ingredient amounts to accommodate the number of people serving. Peel and core the pineapple and cut into 2 inch pieces. In a large ziplock bag add pineapple, coconut milk, brown sugar, vanilla and chili powder. Refrigerate and marinate for at least 4 hours. Skewer pineapple pieces and grill on a preheated grill or grill pan over medium heat. Grill for about 5 minutes or when pineapple begins to brown. Turn frequently. Remove from grill. Be careful when removing because metal skewers are hot. 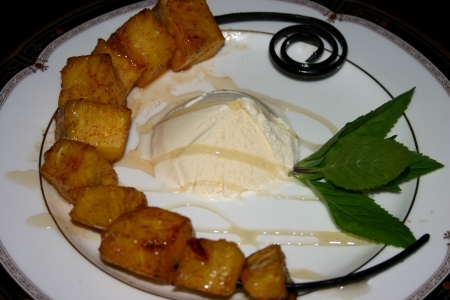 Remove pineapple from skewers and serve over a scoop of ice cream and a drizzle of honey or any remaining marinade.